Is your outdoor space limited? 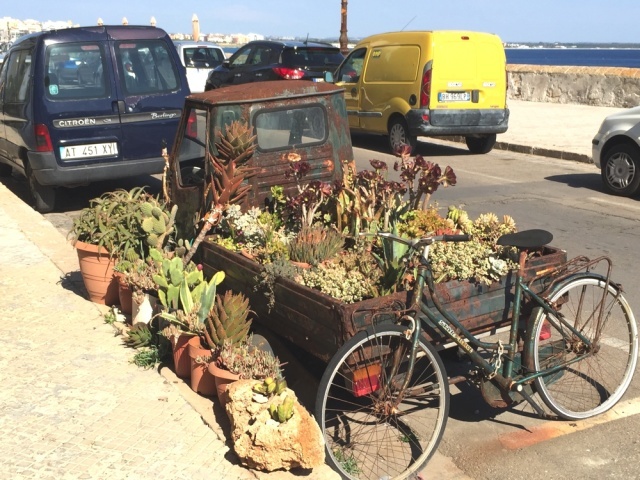 Think outside of the box, I was walking down a street in Puglia cosidering the limitations of window boxes and pots when I stumbled across an inspiring garden in someone's parking space! The owner had a great collection of cacti and succulents growing on and around a weathered and rusted old vehicle that contrasted great with the planting. Was this an environmental statement in reclaiming the streets, or just a passion for plants? Whatever, it was inspiring...You don't need an acre to have a cool plot!